There are several types of topical flea preventatives on the market today, with a few of the most popular being the various versions of Frontline (Frontline Gold, Frontline Plus, etc.) and the K9 Advantix line. While these topical flea preventatives have been known to be effective for years, there have increasingly been reports of them losing effectiveness in the last few years. I’ve used Frontline for years, partly because they’ve been so effective in the past. For at least the last decade I’ve used topical flea treatments on both our dog Soldier and our cat Peanut Butter and had excellent results with no side effects. All that changed this year. 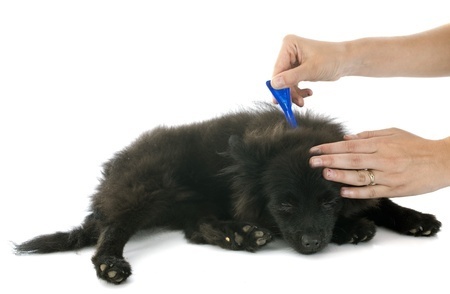 I’m a stickler for making sure we don’t apply any topical flea and tick preventatives too early (it could make my pets sick) or too late (the effectiveness diminishes over time). So a few weeks ago, I applied Frontline to Soldier and Peanut Butter both. A week later, I took Soldier to his favorite groomer. I was shocked when, upon picking him up, the groomer said she’d had to give Soldier a flea bath because he had several fleas. I took him home and watched him carefully, using a flea comb to check him. I also washed all the bedding in the house, the dog bed, the cat bed, and the cat (Peanut Butter was NOT happy). Within just a few days, the fleas were back. It was obvious the topical flea preventative I gave Soldier wasn’t working, so I gave him another flea bath and took him to the veterinarian’s office a few days later. What has your experience been with the topical flea preventatives? Have they worked well for you in the past? Have they lost their effectiveness? What about side effects? There are lots of questions I’ve been asking since this new development. Since the topical flea preventatives worked well for years, I came to rely on them. After doing some research, I’m hesitant to ever go back to a topical treatment and am researching the alternatives. I’d like to learn more about alternative, non-chemical treatments as well. What do you use? Why? I’d love your input! Wow . This is unsettling. It’s been years since I’ve used topical treatments but they worked for me. I’ve only had to use 2-3 times for my cats over the course of 15 years. I think at the time it was Advantage. Not sure if that’s even still around nowadays. Thanks for sharing this news. While we haven’t used topical treatments, it’s good to know the latest. It sounds like you have an excellent vet. We do too. It makes being an advocate for our pets so much easier. Glad to hear that Soldier is flea free again. Tail wags and take care. Some years we have fleas really bad but fortunately the last few years, we haven’t. I have always used the topical treatments in the past. Not sure what I’ll use now. I do have some natural products I really love. I’ll probably use their flea product before getting chemicals but will use the stronger stuff if needed cos we all HATE fleas! We used to use Frontline as well until we heard the same thing – that it wasn’t effective anymore. We now use a 3-month chewable with our dog. We still use topical with our cats, but they are indoor only. So the only issue would be if our dog brought anything in with him. We also foster cats and use topical on them when needed. I hope the brand we use stays effective! It is scary how quickly bugs can develop resistance. There are newer versions of the topicals that may be more effective than frontline plus, but I personally have my dog on the oral preventatives (nexgard or simparica). We switched Soldier to nexgard and it’s been incredibly effective. WOW I don’t use topical with Layla. I clean my house all the time with Apple Cider Vinegar including spraying bedding mine and hers. Layla wears a Disc which works on wave lengths and since she has it on no no fleas phew. Ours are losing their effectiveness but NZ suppliers (so my vet tells me) refuse to pay for the expensive registration of new products so I can’t see us getting anything really effective any time soon. I used to use Frontline for my dogs with no problems whatsoever. But I hated putting chemicals on them and created a natural flea & tick preventative using essential oils. I now use this on my dogs, horses, and myself when out in the woods. It works a charm and I don’t feel guilty at all. In fact, I’ve begun selling it to my clients who were looking for natural solutions. No more Frontline for us. We’ve never had that bad a flea infestation ever but it is scary to know that fleas also have resistant strains like bacteria! Flea treatments are always a topic of controversy and issues! It’s so unfortunate that the topical treatments are losing their effectiveness. That explains why my vet has been pushing for an oral medication. I did try a topical flea treatment a couple months ago (Catego) that didn’t work at all. It also caused one of my cats to have a seizure. I’ve since used Advantage Multi (another topical) for the past two months, and it has been effective, thankfully. You have to get it from the vet though. In the past I’ve also used all-natural flea products, like diatomaceous earth, flea traps, combing, bathing, etc. Those things work, unless you have a very bad infestation. Good luck with your flea stuff… it’s never a fun problem to deal with! I had asked my vet about flea treatments for my indoor cats and he told me he didn’t think it was necessary. I only ever used a topical treatment once for them, after I had a feral kitten in the house who had fleas. I now have a new vet and will ask her opinion. Great information. I too use Frontline Plus for fleas and ticks. I have been cutting back some this year since my older dogs no longer go to the forest preserve and mostly just walk around our neighborhood. Although I haven’t seen fleas on Buffy yet, I have seen ticks. Until the past year, I had never seen ticks just from my yard and the residential area. She was biting her belly recently and even though she had a flea treatment about six weeks ago (should last 3 months), I checked her for fleas and gave her another treatment. I haven’t seen her biting her belly since and she looks a lot better within the first day. I used to use Frontline with my dogs, but two summers ago, it didn’t seem to be working. I asked my vet if the fleas could have developed a resistance to it, and she looked at me like I was crazy. However, she refunded my money and we tried the Seresto collar. It has done the trick for my gang the last two years. Our backyard is heavily wooded and we have a big problem with ticks and Lyme Disease. Additionally, Nelly has a flea allergy, so I really need to protect my pets against fleas and ticks. I think if we had a different yard, we could depend on natural repellents. I’ve heard from so many pet owners that have experienced a reduction in the effectiveness of topical flea and tick treatments. I haven’t tried diatomaceous earth yet, but have heard good things about it as a natural alternative. I hope you’re able to continue to fend off the fleas! I use Revolution on the girls. Even though they are indoor only cats, we have mild weather most of the year in the South. Fleas, ticks, and mosquitoes can get inside easily. So far, I’ve had no problem using the monthly treatment. I’ll ask the vet if she’s noticed anything like this with Revolution when I see her. We were warned about Frontline by our vet as well. We now use Soresto collars during the warm months to ward off fleas and ticks. With all the hiking we do, the ticks are the part that really worries me. They’re great though, bc the collars last 8 months, which is about the length of our flea/tick season, so we only need to buy one per year (per dog). Debbie, have you had any issues with the collars bothering their skin? Soldier has multiple skin allergies, so I worry about irritation. It sounds like they’re very effective, so I may have to give the collars a try. Good post! I use Advantix II for my Huskies for the past 12 years, and (knock on wood! ), it’s been working. You have to wonder about the weather…we have had such an unseasonably warm Autumn… I see some of our typical summer bugs here going a little wild and still about. I have to be extra vigilant now and use our preventative most of the year more for tick prevention than fleas. I have heard from others that they are having issues with fleas (and ticks) more this year than usual. “Life always finds a way,” is a quote from Jurassic Park. Adopting to adversity is part of evolution and it’s no surprise that little nasties find a way to get around things that are trying to kill them too. Frontline has miserably failed me in Long Island NY in the past few years. I have an indoor/outdoor cat and an aging chihuahua. I gave my dog Bravecto and my kitty a new topical. Despite them looking flea-free, I’m bit all over recently! It only takes one fleas to cause havoc.